Bhakti was accepted as a means to attain moksha along with jnana and karma. The development of this cult took place in South India when the Nayanars and Alwars moved against the austerities propagated by the Buddhist and Jain schools and professed that ultimate devotion to god was the means to salvation. People were no longer satisfied with a religion which emphasized only ceremonies. The cult is the combined result of the teachings of various saints, through the then times. Each of them had their own views, but the ultimate basis of the cult was a general awakening against useless religious practices and unnecessary strictness. The cult also emerged as a strong platform against casteism. Namadeva and Ramananda (Maharashtra and Allahabad) – Both of them taught the concept of bhakti to all the four varnas and disregarded the ban on people of different castes cooking together and sharing meals. Sankara and Ramanuja – The propounders of Advaita (non-duality) and vishishta adwaitha (qualified non-duality) respectively. They believed god to be nirguna parabrahma and satguna parabrahma respectively. Vallabhacharya – propounder of shuddha adwaitha or pure non-duality. Chaitanya (Bengal) – relied on the use of music, dance and bhajans to get in touch with God. ‘love’ was the watchword of the chaitanya cult. Kabir – was a disciple of Ramananda, and was raised by a Muslim weaver. He stood for doing away with all the unnecessary customs and rituals in both religions and bringing union between these religions. Nimbakacharya – founder of the Radha-Krishna cult. He expressed this relation to substantiate the importance of marriage. It was also used as an example of God’s love to the people. 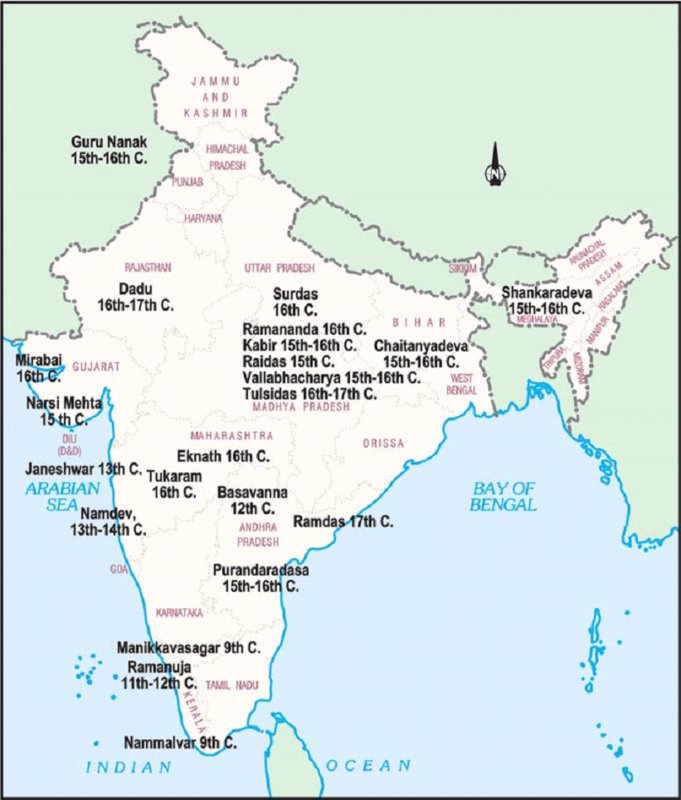 In South India 7th to 9th centuries saw the emergence of new religious movements, led by the Nayanars (saints devoted to Shiva) and Alvars (saints devoted to Vishnu) who came from all castes including those considered “untouchable” like the Pulaiyar and the Panars. They were sharply critical of the Buddhists and Jainas. They drew upon the ideals of love and heroism as found in the Sangam literature (Tamil literature). Between 10th and 12th centuries the Chola and Pandya kings built elaborate temples around many of the shrines visited by the saint-poets, strengthening the links between the bhakti tradition and temple worship. Shankara, from Kerala in the 8th century, salvation .was an advocate of Advaita or the doctrine of the oneness of the individual soul and the Supreme God which is the Ultimate Reality. He taught that Brahman, the only or Ultimate Reality, was formless and without any attributes. He considered the world around us to be an illusion or maya, and preached renunciation of the world and adoption of the path of knowledge to understand the true nature of Brahman salvation. Ramanuja, from Tamil Nadu in the 11th century, propounded the doctrine of Vishishtadvaita or qualified oneness in that the soul, even when united with the Supreme God, remained distinct. Ramanuja’s doctrine inspired the new strand of bhakti which developed in north India subsequently. This movement began in Karnataka in the 12th century which argued for the equality of all human beings and against Brahmanical ideas about caste and the treatment of women. They were also against all forms of ritual and idol worship. The most important among them were Janeshwar, Namdev, Eknath and Tukaram as well as women like Sakkubai and the family of Chokhamela, who belonged to the “untouchable” Mahar caste. This regional tradition of bhakti focused on the Vitthala (a form of Vishnu) temple in Pandharpur, as well as on the notion of a personal god residing in the hearts of all people. These saint-poets rejected all forms of ritualism, outward display of piety and social differences based on birth. It is regarded as a humanist idea, as they insisted that bhakti lay in sharing others’ pain. Criticised the ritual and other aspects of conventional religion and the social order, using simple, logical arguments. They advocated renunciation of the world. To them, the path to salvation lay in meditation on the formless Ultimate Reality and the realization of oneness with it. To achieve this they advocated intense training of the mind and body through practices like yogasanas, breathing exercises and meditation. These groups became particularly popular among “low” castes. Probably lived in the 15th-16th centuries. We get to know of his ideas from a vast collection of verses called sakhis and pads said to have been composed by him and sung by wandering bhajan singers. Some of these were later collected and preserved in the Guru Granth Sahib, Panch Vani, and Bijak. Kabir’s teachings were based on a complete, rejection of the major religious traditions and caste systems. He believed in a formless Supreme God and preached that the only path to salvation was through bhakti or devotion. The language of his poetry was simple which could even be understood by ordinary people. He sometimes used cryptic language, which was difficult to follow. The Committee on Empowerment of Women (Chairperson: Ms. Bijoya Chakravarty) submitted its report on ‘Women’s Healthcare: Policy Options’ on January 3, 2018. Synergy between the central and state policies: The Committee noted that synergy between the central and state policies will bring changes in women’s healthcare. For example, the Committee observed that transportation of expectant mothers to the nearest delivery points still remains a hard task in view of (i) difficult geographical terrains, (ii) lack of transportation facilities, (iii) natural calamities, (iv) security threats, curfews, hartals, among others. In this regard, the Committee recommended that the central government must discuss with states to build ‘pre-delivery hubs’, preferably close to the delivery points to take care of such transportation issues. Further, it observed that such hubs would help reduce the out-of-pocket expenses of poor and marginalised families and also reduce maternal deaths. Functioning of Rastriya Swasthya Bima Yojana: Rastriya Swasthya Bima Yojana (RSBY) is an insurance scheme for the below poverty line families as well as certain categories of unorganised workers. It aims to reduce their out-of-pocket expenditures on health and increase their access to healthcare facilities. The Committee noted the following issues with RSBY’s implementation: (i) exploitation of poor beneficiaries at the hands of private hospitals empanelled under RSBY (in the form of avoidable surgeries, wrong diagnosis, etc. ), (ii) low enrolment percentage of households under RSBY indicating lack of awareness among the targeted population, and (iii) varied feedback with regard to quality and accessibility of hospitals. The Committee recommended a mechanism for oversight across all the districts in the country where RSBY is implemented. Further, the Committee also recommended that data pertaining to RSBY be made freely available on public platforms. Demand for Accredited Social Health Activists (ASHA): ASHA workers provide support in tracking the health of pregnant women, help them avail benefits (such as Janani Suraksha Yojana entitlements), and aid the grassroot implementation of health programmes. The Committee noted that ASHA workers across the country do not have fixed wages and that they have demanded a fixed wage component within their remuneration in many states. In this context, the Committee recommended a proposal for assured monthly wages not less than Rs 3,000. Further, the Committee also highlighted other issues regarding the training of ASHAs such as dearth of competent trainers, infrastructure, and equipment. Need for food fortification: The Committee noted prevalence of anaemia among women in rural areas to be worse than in urban areas. This is despite the implementation of National Food Security Act, 2013, Mid-Day Meal scheme, and the Public Distribution System. In this context, the Committee observed that the government priority has been on the issue of increasing the availability of food alone, rather than ensuring nutritional aspects of it, through approaches like food fortification. The Committee recommended that fortification of cereals with iron must be taken up with priority since (i) it does not alter the quality and nature of foods, (ii) can be introduced quickly, and (iii) can produce nutritional benefits for populations in a short period of time. Unsafe abortions: The Committee stated that unsafe abortion is a leading reason for the high percentage of abortion related deaths in the country (eight percent of all maternal deaths per year). It observed that the reasons for it could be the following: (i) awareness about abortion being low, and (ii) women must seek legal recourse if the pregnancy has gone over 20 weeks to terminate the pregnancy; however, a slow judicial process ensures that the pregnancy crosses the legal limit and the woman is unable to get the abortion done, thus, pushing her to the quacks in both rural and urban areas. The Committee recommended amending the Medical Termination of Pregnancy Act, 1971 to raise the permissible period of abortions to 24 weeks with this bar not applying to unborn babies having serious abnormalities. Further, it recommended removing the provision where only married women can get an abortion thereby allowing anyone to get an abortion. Mental health of women: The Committee noted that due to societal stigma and ignorance, mental illnesses suffered by women fail to get recognised. In this regard, the Committee recommended creating awareness and providing possible remedies to help de-stigmatise mental health issues. 3. Agriculture 2022: will the dream come true? Linking MSP to production cost – Finance Minister (FM) announced 1.5x input cost MSP (Minimum Support Prices) prices for Kharif crop to farmers. Given that many product prices have been forced below MSP in recent times, the budget reiterates the need for effective implementation of MSP and directed Niti Aayog to introduce a mechanism to ensure farmers get adequate price for their produce. The budget has enhanced the food subsidy to FCI by almost 35 percent. Agri Market Development – The government announced full implementation of eNAM system (online agriculture marketplace) by March 2018, which would empower the farmers with ample bargaining power to fetch justified prices. In order to facilitate the small farmer’s access to these online platforms the government has announced plans and allocated Rs 2000 crore to upgrade rural haats or Gramin Agricultural Markets which would be linked to eNAM. Crop insurance – The 21 percent increased allocation towards Crop insurance schemes, at Rs 13000 crores, will help in stabilizing and stabilizing farmer incomes and protecting farmers from anomalies of weather, crop damage and market dynamics. Irrigation reforms – The government has allocated Rs 2600 crore towards irrigation reforms and announced incentives for rapid development and penetrations of farm irrigations systems. This would help to reduce dependency on weather and monsoons. Institutional credit to farmers –The allocation for rural institutional credit has been enhanced to Rs 11 lakh crores which would increase the volume and penetration of institutional credit. Moreover, the budget has suggested suitable mechanism to enable access of lessee cultivators to credit without compromising the rights of the land owners. Push for allied activities and value added products – The budget emphasized the need to improve farm income by incentivizing allied farm activities and rural non farming incomes, a move we had reiterated time and again. Separate provisions have been announced for the development of aquaculture and animal husbandry with increasing the allocation to these segments. 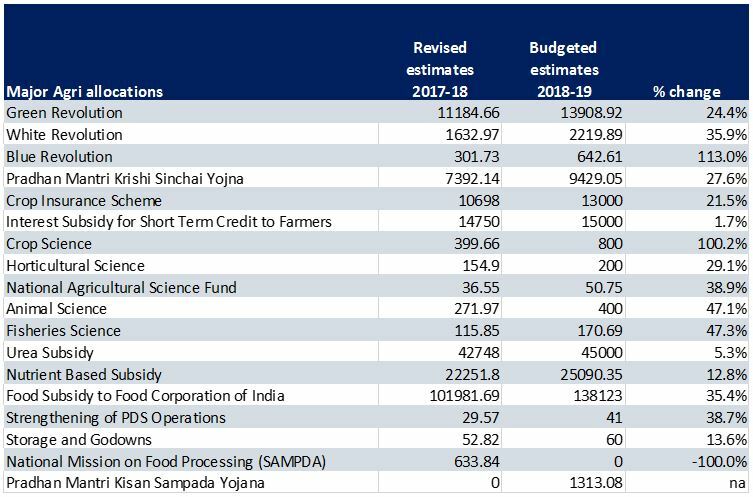 Push to Food processing – The budget has doubled the allocation under the Krishi Sampada Yojana in order to push the Food processing industry which would eventually be the major off takers of farm produce. Increasing the subsidy for Fertilizers – The budget has substantially enhanced the amount allocated towards fertilizer subsidies, both urea and nutrient bases subsidies by almost 8 percent to Rs 70000 crore, which would provide relief to Urea and Non urea fertilizer companies. Moreover this would also help lubricate the pan India DBT implementation. Liberalization of Agri exports – FM has announced the liberalization of the Agri export policy and enhancement of the testing facilities for exports. This would help in boosting the exports to intended potential and improve incomes for farmers. Deduction to farm producer companies – The budget has proposed to extend the benefit of 100 percent tax deduction on profits to Farm producer Companies with net turnover below Rs 100 crores. This move would help promote small Agri companies and enhance rural incomes. Trading of agricultural commodity derivatives – The budget amends the provisions of commodity transaction tax for derivative transactions on agricultural commodity and now defines them as non-speculative transaction income. This would boost agri-commodity transactions in the derivative market. They have been at the forefront of technological development in the biofuels sector by providing economically viable, low-carbon solutions. Moral desirability of organ donation must be balanced against the coercion that altruism usually carries in unequal societies.